One of the ugliest fish there ever was, monkfish, is however highly appreciated because of its delicious taste and tender meat. When I see them in the market, I can't help wondering who was the first human to try such horrible creature. I reckon that ugliness is a relative term, and that the idea we have of a monster is intimately related to our psyche, our dreams. I think it is a matter of symmetry. 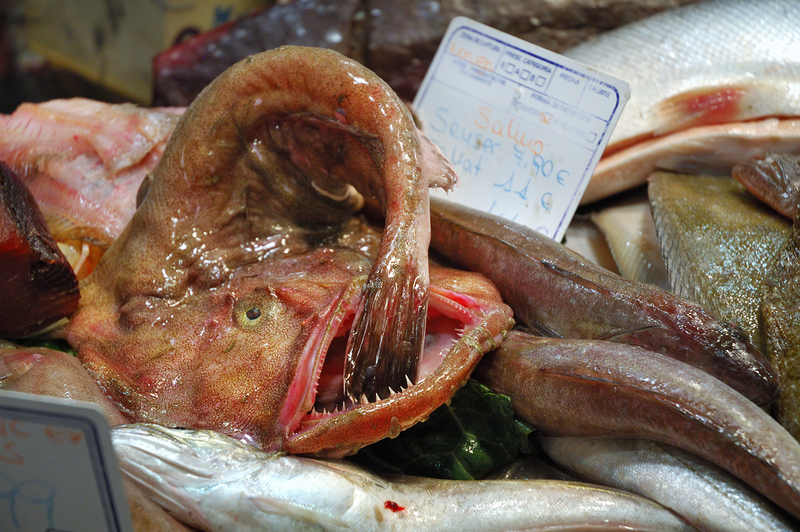 If you take a look at this fish at La Boqueria market, the first thing that calls our attention is that big mouth, totally out of proportion. Besides, the body is flat and the eyes are on top. It doesn't look at all like a "normal" fish. As you see, we apply our concept of beauty, of harmony, to animals too. Monkfish remind me of abyssal fish in spite of living in the continental shelf (200 m approx.) and the continental slope (up to 1000 m). They even have that dorsal spine above which they use to lure preys which resemble fishing rods (that's why they are anglerfish too) so familiar when we think of deep water fish. The abyss by itself generates fear in our minds. Every time they bring out some fish from the bottom it has that demon-like aspect, pretty common in old illustrations about the sea and journeys towards remote, unknown corners of the world. I wonder why so? It is not the monkfish's fault to have benthonic habits, that is, to live in the bottom and have adaptations to that habitat, like the flatness, the position of the eyes, the color of the skin and the enormous mouth. What turns that into a monster? When did it appear as such in our primitive mind?. That fear of the unknown together with a menacing look might trigger a signal indicating danger to our existence. Who knows! Maybe we'd better kill the monster and eat him just in case. Some monkfish recipes to have at hand after the "killing". Lovely and well documented comment,I enriched my vocabulary with this fierce monkfish. I learned a lot from your blog about this fish. Its not a common market sighting here in the Philippines but we also have shares of weird-looking fishes. Monkfish are usually thrown back to the ocean for fear of "curse" or poison. -You say you throw them back into the sea. That is interesting and very much matches my post today in the sense that some fish are regarded as monsters sometimes. Thanks for that piece of information. What a great post! The fish foto is too monsterish! Delightful...but would I eat one? I dunno! In the Northeast US, some people call it the "poor man's lobster." He is an ugly looking fellow. Fascinating narrative and yes I learned a lot too, especailly living coastal it is fascinating to me. Your blog is truly gorgeous! You are amazing with that camera of yours! the fish is muy feo, but I guess there has to be a little bit of everything in life. Great pics, I truly enjoy your blog. I'm not a lover of fish - it is all those bones I fear.